Since our visit last year to Bletchley Park, TNMOC have added a few more old bits. Thus here we go again! Transport is via personal means and/or car share. No doubt we’ll clear up all details at the Beeston Blue Moon Beers and subsequently on the maillist. Provisionally, the car shares depart Nottingham about 7:30am sometime civilised to arrive for 9:30am sometime in the morning as the gates open so as to beat the crowds. Rendezvous can be via mobiles and the Bletchley Park cafe hut. There’s easily more than enough there to see and do to become completely lost for the day! John is arranging for a ‘special tour’ for us all via his inside connections for TNMOC in the afternoon. Cost: £15 for Bletchley, £5 for the National Museum of Computing or £2 Colossus and Tunny only, concessions are available – so bring ID! Don’t forget your passes and ID needed from last year for those so organized! Bletchley Park to go Themed-and-Branded? I think that our “experience” of the place was that the volunteer enthusiasm and functional worn look of the place were very much authentically what Blatchley Park was. The non-glitzy non-museum look makes it all very real for what was done there and when and how. As for the “1 hour” “experience” mentioned: We found there was still yet more to explore after two full days of visits! I hope the volunteers and general opinion can save all that is very enthusiastically wartime British about the place and maintains the good will and enthusiasm of the volunteers there who are essential to bring it all alive. Paid actors hopelessly just ‘do not get it’. I also hope that the Churchill memorabilia and the lifelong custodian can very soon find new continued life with a welcome somewhere nearby. Here’s hoping that a remarkable relic of our recent past is not dumbed down to be a 1 hour dash to the trinkets shop. Whilst I really enjoyed the experience, they might simply not be bringing the money in. I can understand why what we did might be “dull” to younger children who don’t understand the history or aren’t yet deeply into tech beyond playing games; and trying to engage them to bring in more people is a “good thing”(tm). Although whether the cost of paid actors (who may or may not care about the history) over volunteers (who do care) is offset by increase revenue is a good question. The sacking may well have been correct according to the terms of contracts, but it is bone-headed in the extreme. Bletchly attracts one set, NMC attracts another. They can then feed off each other’s slightly different capture demographics. I wonder if the Trust is upset that the NMC has that natty little computer lad wall-to-wall with old Beebs, Segas etc? Kiddy heaven. Reminds me, I really must get my BBC B+ down from the loft. I have the 6502 co-pro, I have the disc drive, I have *THE* disc; all I need is a compatible analog joystick and “Elite Executive Edition” here I come. Hmm…I wonder if something could be made to convert a modern USB joystick/game pad into analog signals? Anyway; it does sound like they want to flat-pack, portion and commoditise the park into yet another, bland “informercial” type experiences. When will the “Turing Teacups” arrive? … Anyway; it does sound like they want to flat-pack, portion and commoditise the park into yet another, bland “informercial” type experiences. When will the “Turing Teacups” arrive? That sounds like the gist of the angst and especially so for how changes are being made… It would be a great shame if the sudden influx of grant money sours the working of the place rather than everyone enjoying the place being sympathetically improved for all. The ongoing fencing off and isolation sounds very silly and even destructive towards a dedicated volunteer group. Very sad. Can something positive be done? … But if little can be said about his later work, more is now being said about the key role he, and those other engineers, played in the Allied war effort. Despite this, he is modest about the significance of that task. During World War Two, Britain led the world in its creation of machines that excelled at cracking codes used by its enemies. Messages scrambled using the Enigma machine were cracked by devices largely designed by maths genius Alan Turing. … Colossus was kept secret for decades after the war and it is only recently that a full picture of its influence and engineering brilliance has become apparent. But it was not the only code-cracking computer that Britain made. Steadily more details are emerging of the secret machines that came after Colossus and surpassed its ability to unscramble messages. He worked at Bletchley Park during World War 2, and his work helped accelerate Allied efforts to read German naval messages enciphered with the Enigma machine. “It is an honour for us to be invited to present some new music at the Proms and to celebrate Alan Turing 60 years after his death,” Pet Shop Boys duo Neil Tennant and Chris Lowe said in a statement. The largest gathering of veterans who operated the Colossus code-cracking computer in World War Two has been held at Bletchley Park. … TNMOC trustee Tim Reynolds said the meeting was held in September to mark another 70th anniversary associated with Colossus – the opening of the first hut, called Block H, built to house the machines. “It was the world’s first data centre,” he said. At the reunion, TNMOC staff also talked about work it had done to create a virtual version of the two buildings that housed the Colossi – Block H and F – to give people a better idea of what it was like to be an operator during wartime. A new centre dedicated to the heritage and culture of gaming in the UK is to open its doors next year. The £2.5m National Videogame Arcade will open to the public in Nottingham in March and will include an exhibition of old consoles and controllers. The centre, set over five floors, will include galleries with themed and interactive exhibitions and a games-making education area. The museum’s developer GameCity said it would celebrate gaming history. For all the conflict between console gamers and their PC brethren, kids today have never had it so good. … you can today thank the Internet Archive for making 900 antique computer games conveniently playable within your web browser. An original part of one of the UK’s pioneering computers has been found in the US. The part is a significant chunk of Edsac – a machine built at Cambridge in the late 1940s to serve scientists at the university. It came to light because of publicity surrounding an effort to rebuild the computer. The part has now been donated to the rebuild project and will be incorporated into the finished machine. A project to recreate one of Britain’s pioneering computers has reached a key milestone. … As The Reg has previously detailed, EDSAC has a distinguished place in computing history because its design influenced that of LEO, a British business computing effort that was probably superior to IBM’s S/360. EDSAC’s initial tasks were assisting scientists, a role it fulfilled well enough that the Museum says it assisted in the winning of at least one Nobel Prize. Hermann Hauser has officially opened the EDSAC display at The National Museum of Computing at Bletchley Park. … Although there were just 186 staff at Bletchley in August 1939, by 1942 there were 1,600 and by the end of 1944 this had risen to 8,743. Three-quarters of them were women, made available by the introduction of female conscription in 1941. Their stories have been neglected, largely because the exploits of the leading Bletchley code-breakers are more exciting. 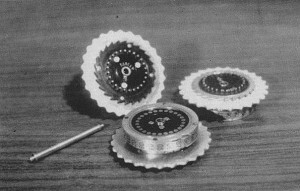 The women who have found their way into the histories have tended to be the handful of female cryptanalysts. Joan Clarke has now been given spirited if pouting form by Keira Knightley. Once muzzled by officialdom, former operators of Colossus have reacted well to a Royal Mail stamp marking the achievements of the computing beast and its designer, Tommy Flowers. The Colossus stamp is part of eight in the Royal Mail’s series, called Inventive Britain. … The story of the German Enigma machine is well-known – a device built to provide secure communications but which British code-breakers managed to crack at Bletchley Park. But there is another story – not fully told until now – about what came after. … it seems the detailed knowledge of the machines and their operations may have allowed code-breakers to cut the time needed to decrypt messages from the impossible to the possible. … Enigma machines were sent to Romania as a German ally, until it switched sides to the Allies in 1944, so Reuters speculates that there may be still others undiscovered in the country. The National Museum of Computing (TNMOC) is going to fire up its replica Enigma code-breaker to decrypt encoded messages sent from Poland – with an original wartime Bombe operator supervising the process. The British museum’s Bombe replica, recently moved into the original Block H building that housed the wartime Bombes, is a fully functional reproduction of the machines that broke Nazi Germany’s Enigma ciphers during the Second World War. … As part of the World Computer Congress being held in Poland this Friday (21 September), the Bombe will be fired up … While the machine does its work (this is 1940s technology, remember), participants in the conference will hear papers about cryptography, the Bombe and master codebreaker Alan Turing, who, along with Gordon Welchman, was one of the leading minds behind the creation of the original Bombes. … Interested folk can watch the challenge live from around 0830 BST on Friday [21/09/2018] on the World Computing Congress website. Bletchley Park’s National Museum of Computing will be exhibiting original, freshly discovered decrypted WWII messages to coincide with the 75th anniversary of D-Day this June – messages that were broken by the Colossus machines based on the museum’s site. The decrypts are due to be put on display in The National Museum of Computing’s (TNMOC) Colossus gallery, which houses the world’s only working replica of the Colossus code-breaking computer. Good to see TNMOC are developing further regardless of their neighbour! For computing history nerds, the names Tommy Flowers and Harry Fensom likely conjure up images of the code-breaking Colossus. But after the war, they also had a hand in creating a dearly loved, much-anthropomorphised, millionaire-making machine: ERNIE.